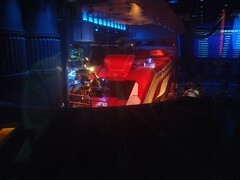 Star Tours is pretty much the only transfer ride I will do with Mik since it is an easy seat to seat transfer and there is no rush with the ride vehicle not being on a track. We had already done the new Star Tours in Disneyland and I did not much care about doing it in Disney World, but it is one of Mik's favorite rides, so we decided try the WDW version. It ended up being a good choice to do it at Disney World because you actually get a better queue experience than Disneyland. 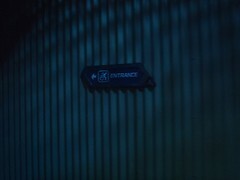 At Disneyland we just get the boring outside line and little bit interesting one room experience, but you miss out on seeing C3PO and the ride vehicle model in the regular queue when you go in the side door for the elevator. At WDW we ended up skipping the whole line (I think only because the wait time was not that long) and going a separate way to the loading area. We still skip the inside queue, but the way it is set up a WDW allows you to get an overlook view of C3PO and the vehicle model. The actual boarding process is just like at Disneyland, though. You can roll the wheelchair into the ride vehicle and the Cast Member will take it out and bring it back at the end of the ride. The armrest can be swung to the side to make transferring easier. Disneyland: "it's a small world"